US X-37B robot minishuttle: 'Secret space warplane'? Tomorrow, the US Air Force will finally launch the long-delayed X-37B unmanned mini space shuttle, dubbed by the Iranian government a "secret space warplane". But what is it actually for? Probably nothing hostile, most of the time, is the answer. But it could do some quite naughty and interesting things if required - and what's more, it could probably do them without anyone knowing about it. 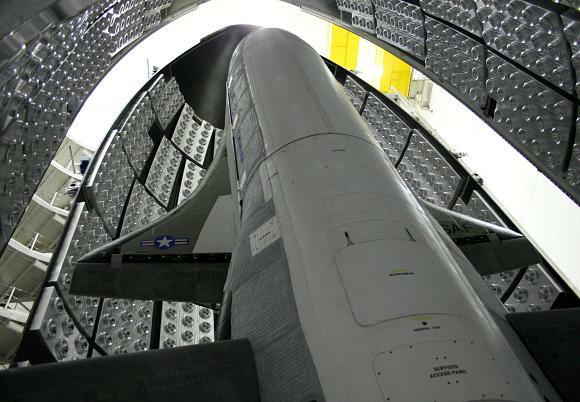 The X-37 has had a long and chequered development history. It was built by Boeing's "Phantom Works" advanced-concepts shop, originally for NASA - though it had Air Force heritage from the beginning, drawing heavily on the USAF's X-40 experiments. NASA saw the craft as a potential "lifeboat" for the International Space Station, but that requirement wouldn't really call for a winged re-entry vehicle: the ISS lifeboat is in fact a common-or-garden Soyuz capsule - perhaps now to be replaced at some point by an American Orion salvaged from the ruins of the Constellation moonbase programme. Neither has wings, or any real need for them. NASA dropped the X-37 after some work involving release of test airframes in the atmosphere and so on. But the spaceplane lived on, supported at times by funds from maverick military tech bureau DARPA and some from the Phantom Works itself. Nowadays the project is run by the US Air Force Rapid Capabilities Office as the X-37B, which was originally set for an orbital test as soon as 2008. That timeline has slipped well to the right, perhaps as a result of reported technical hiccups including one where a prototype atmosphere test craft, dropped off in the stratosphere by Scaled Composites' famous "White Knight" high-altitude jet mothership*, came in successfully for a landing at Edwards Air Force Base in California - but then ran off the end of the runway. Next page: Why would a re-usable vehicle need wings specifically?